John McCutcheon's 40th record celebrates the depth of Pete Seeger's influence by embracing the breadth of the music he inspired. When Pete Seeger passed in 2014 at age 94, there was an immediate response that an era had passed, that our connection to Woody Guthrie and that old, wild, and wonderful American songbook had been severed. But Seeger himself would have decried such defeatist emotionalizing, particularly since it had been his life's work to spread America's deep and varied song heritage far and wide, to keep it alive in the generations that followed him. At most, he might have allowed, we'd lost an elder statesman of the scene, but America's great folk heritage was still being held true in dozens of other capable hands. Among them, John McCutcheon has been as stubbornly dedicated and prolific in upholding the traditions of Appalachian folk singing. Inspired as a young man by Seeger, McCutcheon can now count more than 50 years of performance and 40 album releases, both celebrating the country's folk tradition and adding to it as songwriter of rare talent. With To Everyone in All the World, McCutcheon and a collection of peerless musical contemporaries celebrate the 100th anniversary of Seeger's birth and offer up a tribute in the form of reverent and creative interpretations of 15 songs either composed or popularized by the beloved performer. In the breadth of their performances and interpretations, McCutcheon and company emphasize both the expanse of Seeger's reach and the depth of his influence. The German sing-along "Die Gedanken Sind Frei" immediately precedes the Samba beat-driven "Guantanamera. Tim O'Brien and members of Hot Rize frame "Well May the World Go" in a frolicking bluegrass arrangement. The folk-rock treatment of "If I Had a Hammer" is built upon a slippery Cajun bed, with help from members of Beausoleil, while "Letter to Eve" slinks along on a Beale Street blues shuffle. And maybe most surprising to purists, bluesman Corey Harris joins McCutcheon on "Talking Union," first recorded by Seeger and the Almanac Singers. The group's refreshing and funky rap treatment is jaw-dropping, fun, and a grand gesture that demonstrates just how deep the roots of "Americana" run and how far its branches reach by reminding us that the talking blues was a precursor of rap and affirming that latter genre's place as an American folk art form. 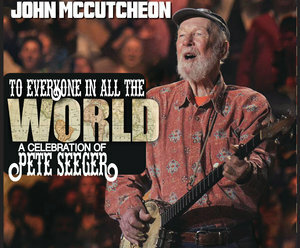 Produced by McCutcheon with Bob Dawson, To Everyone in All the World: A Celebration of Pete Seeger is one of the best Americana albums of the new year. Its breadth of form and style demonstrates simultaneously both the reach of Seeger's influence and the variety of influence that forms American music. At a time when Americans are being discouraged from embracing difference, this album serves as an important reminder of just how broad and varied the definition of an American is and it perpetuates the spirit of inclusion that was central to Seeger's lifelong work. If music is our lifeblood, then we are all a mix of tribes and we are at our best when we dance and sing together.